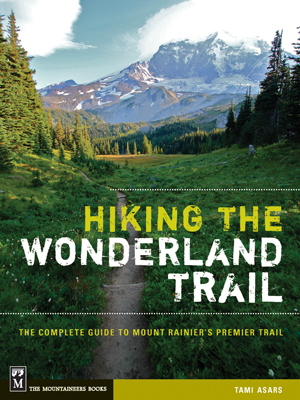 If you are hoping to hike the Wonderland Trail, all or in part, this coming summer be sure to get your permit reservation request in now. Yesterday was the first day to fax requests, but because it was a Sunday, today is the first day to snail-mail letters. Technically you have until April 1st to get your permit reservation requests submitted, however, the early bird often catches the worm. As they like to say, don’t put the pro in procrastination or you’ll get the dis’ in disappointment and that, friends, would be sad. My feet were antsy this past rainy Tuesday. They couldn’t stop bouncing under my desk as I threw together paragraphs and marinated myself in trail talk. After several hours of writing my brain couldn’t take one more sentence so I hit the kitchen for a snack and turned on the news. The weather gal, looking dapper in her woolen suit, grinned and said Wednesday’s weather was going to be unseasonably warm and partly sunny. That was all it took for my wheels to start turning and for my busy brain to formulate a plan. 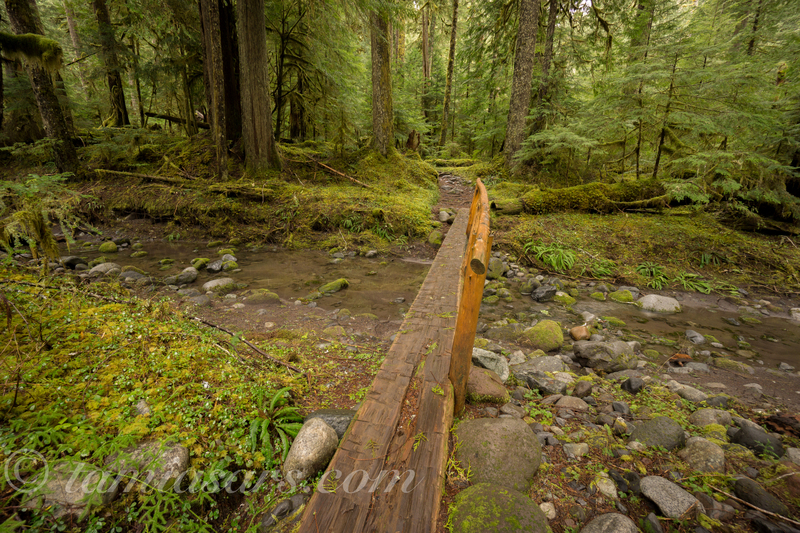 It was February, but I had to get my legs out for a day on the Wonderland Trail. 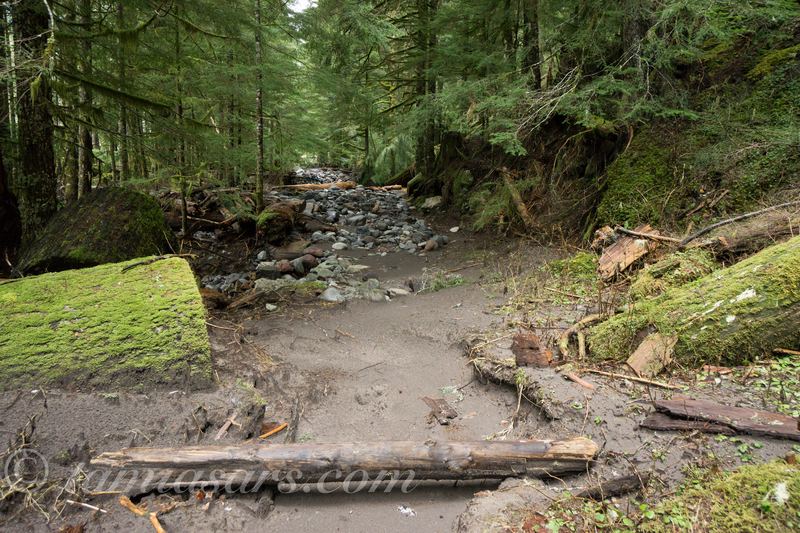 After the heavy rains this past fall, I knew that there would be some trail damage and I wanted to see what kind of spring the trail crews would have in store. 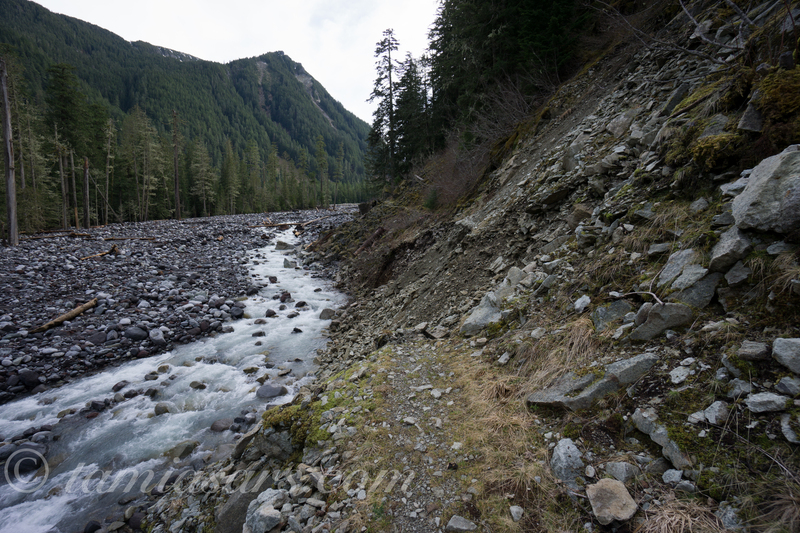 As I suspected Mount Rainier had been at it again with her water-chisel, overtaking stretches of the Wonderland and trying her best to wipe out what’s left of the Carbon River Road. 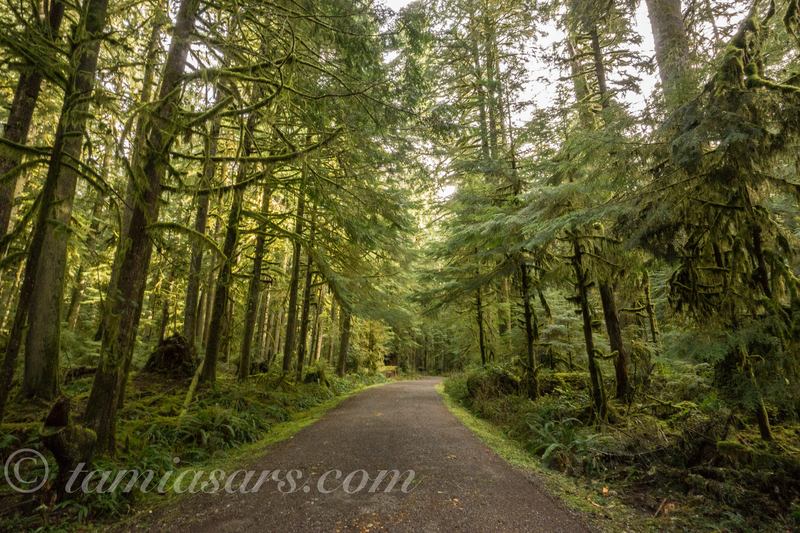 I entered and exited via the Carbon River Road in the Park’s northwest corner. The road walk was enjoyable, and I nearly tweaked my coccyx in my happy dance when I saw that the Park Service had restored and reconstructed the historic log cabin that had been removed when the floods of 2006 undercut it’s foundation. 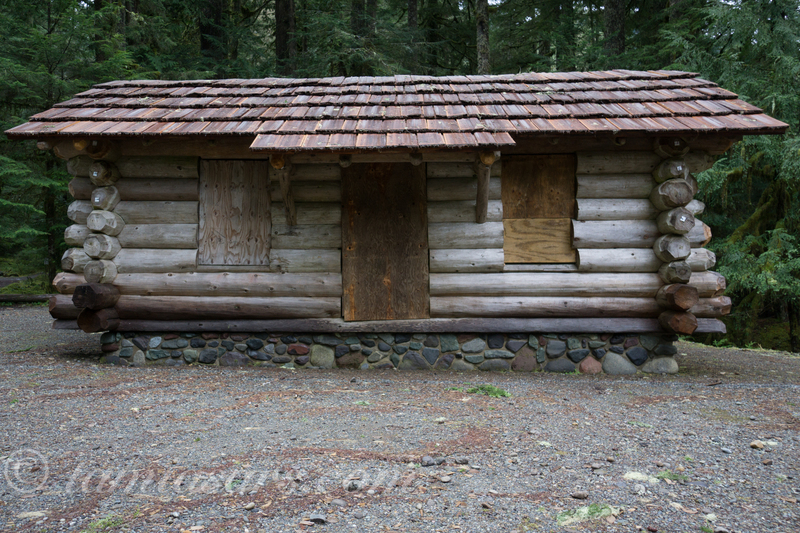 Now, the beautiful old structure, sits at Ipsut Creek Campground, waiting for summer months and visitors to admire its aged timbers. 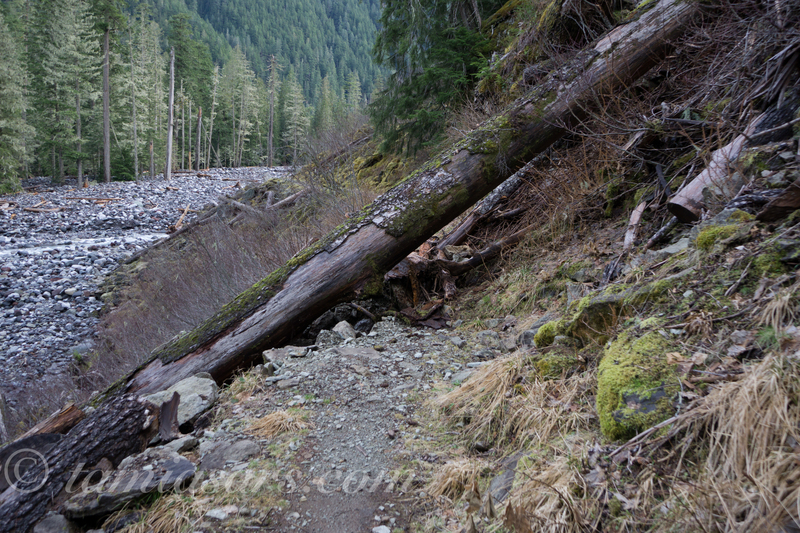 The true mystery is how, in the Sam Hill, did the Park get the logs up the washed out Carbon River Road? Regardless, what a joy to have it back! The Ipsut Campground is looking very lonely these days compared to the busy times I remember when car camping was allowed. 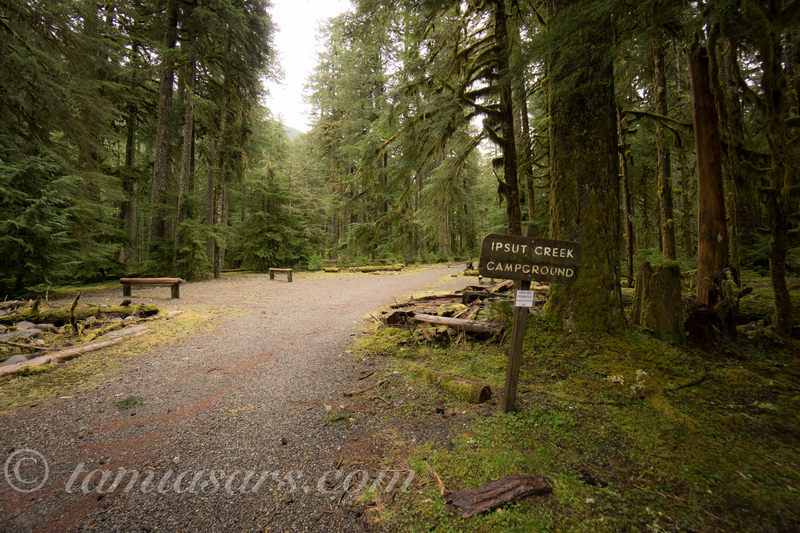 There is an eerie tranquility about a quiet, backcountry campground inactively resting without a soul in sight. 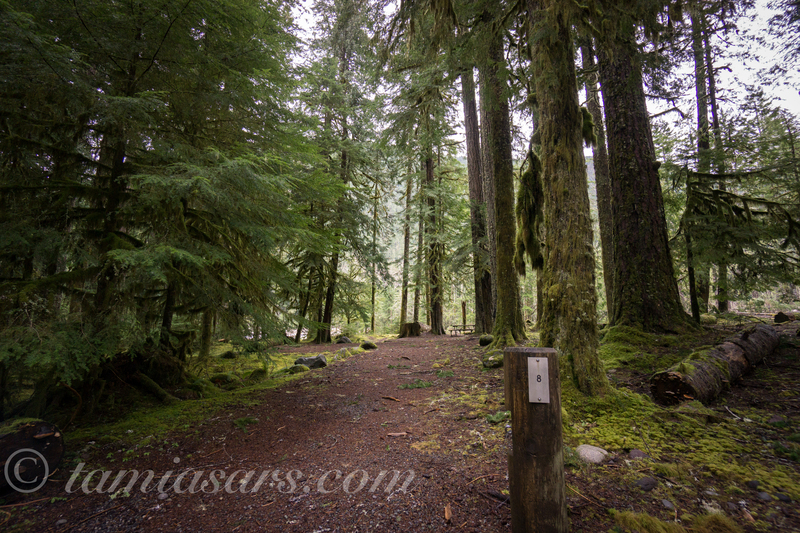 The mossy picnic tables, the debris strewn over the tent sites and the mellifluous singing of a Winter Wren in an old growth tree high above made me feel grateful to experience that fascinating moment. mysterious note on the trail…. The drawing looked like a bunch of lines, then circles which I presume were rocks. 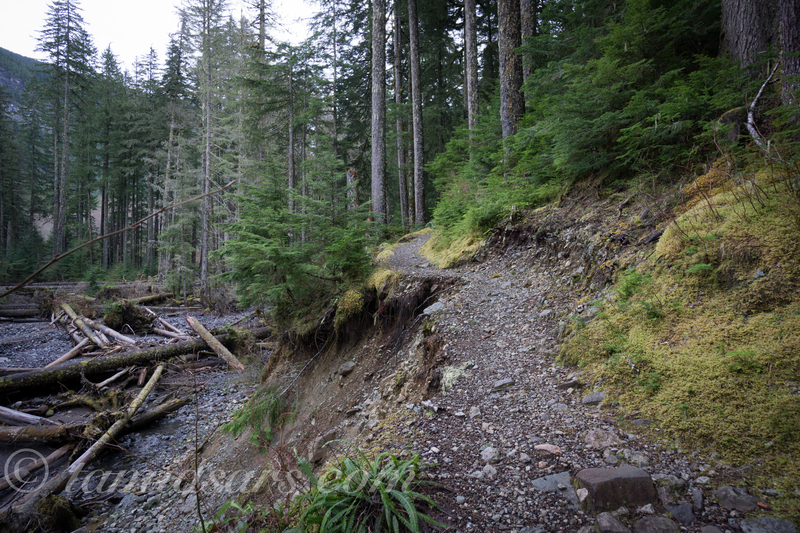 Arrows showed the trail dropping off and the river directly below the washout. I stood and considered my plight of seeing this washout with fading daylight left in my outing. Summit fever overtook me, so I huffed as fast as I could 2 miles up the trail as the sun popped down over an opposing hill. Sure enough, there was a washout. In fact, there were three of them. The worst one was where the Wonderland had been completely chewed off a hillside by a loose scree and sand field. Photos do not do this justice, and yes, not for “amateur”. 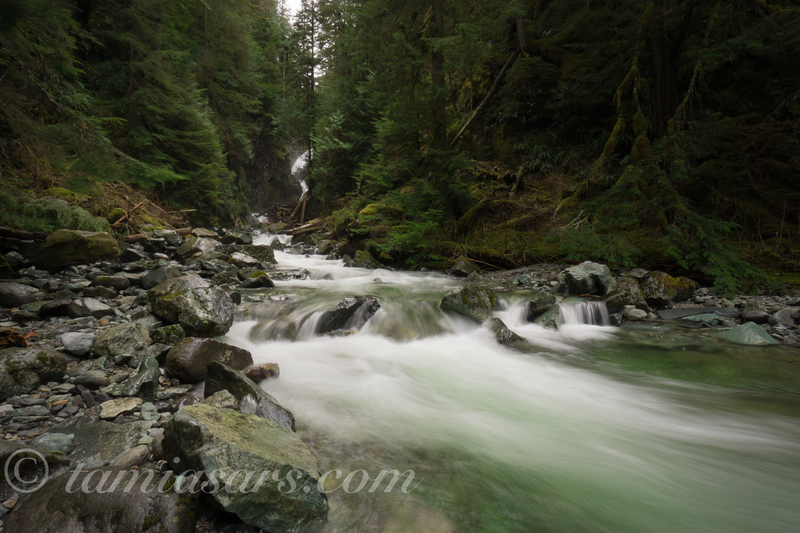 One slip has you sliding down the loose debris and doing the backstroke in the milky, churning Carbon River. 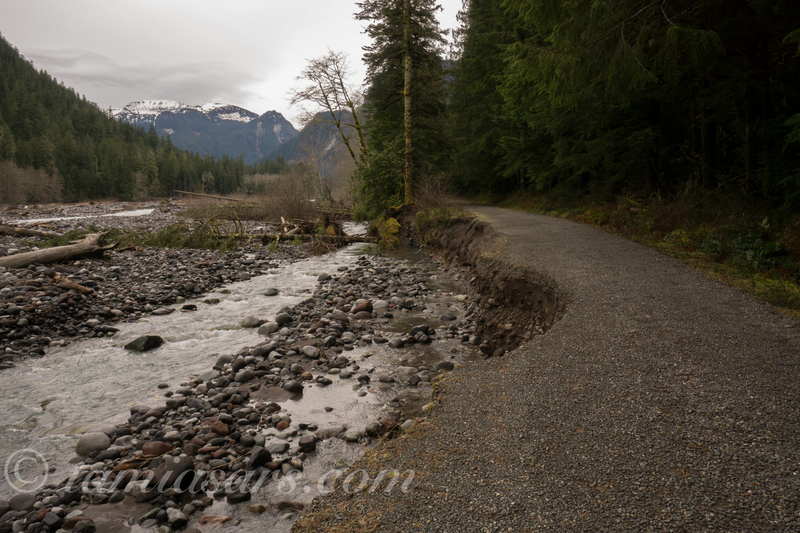 The washout just before the Wonderland Trail detour over the lower Carbon River. The bridge is out as well. Look what I found! I didn’t’ stop for a sniff…. Another stretch of the Wonderland along the riverbank is completely gone and now has become an ankle-twisty game of navigation through colorful rocks and sandy shorelines until you find the trail again on the other side. More casualties were every where I looked. 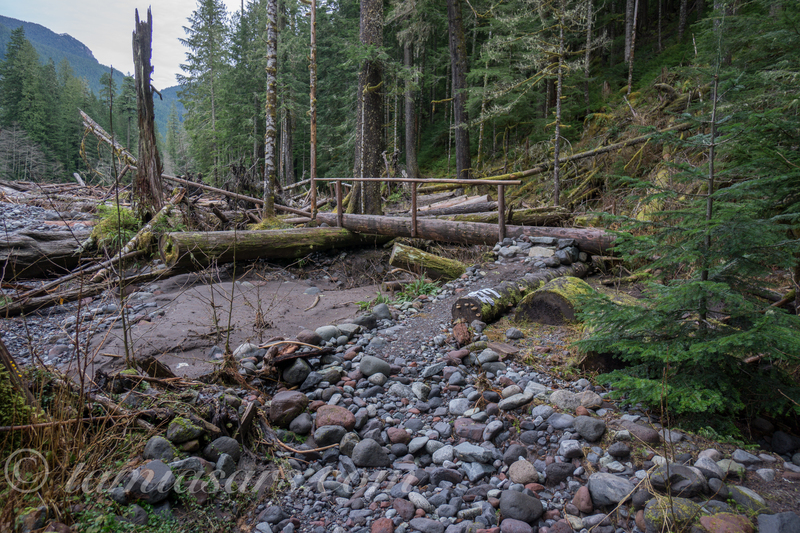 Chenius Falls is missing it’s bridges, and even the Rain Forest Loop at the parking area was missing a bridge. But it was beautiful; oh how beautiful! 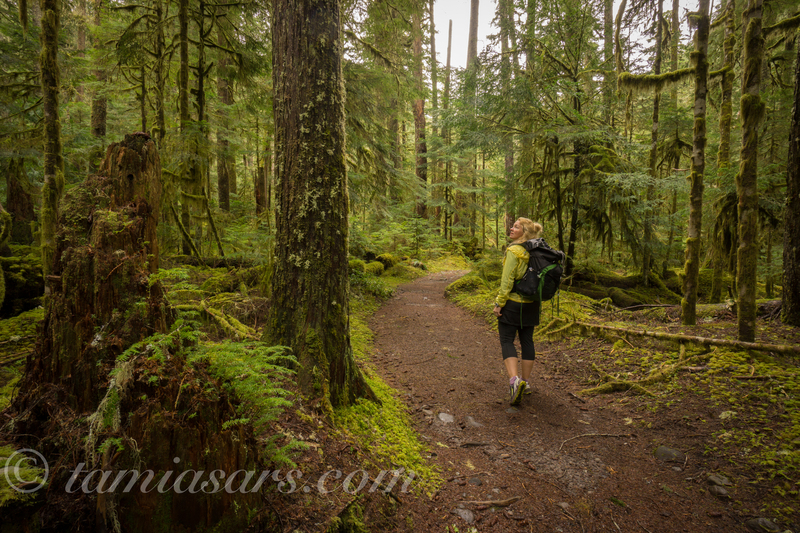 The old growth trees and mossy forest almost burned my eyes with shades of lime and emerald. 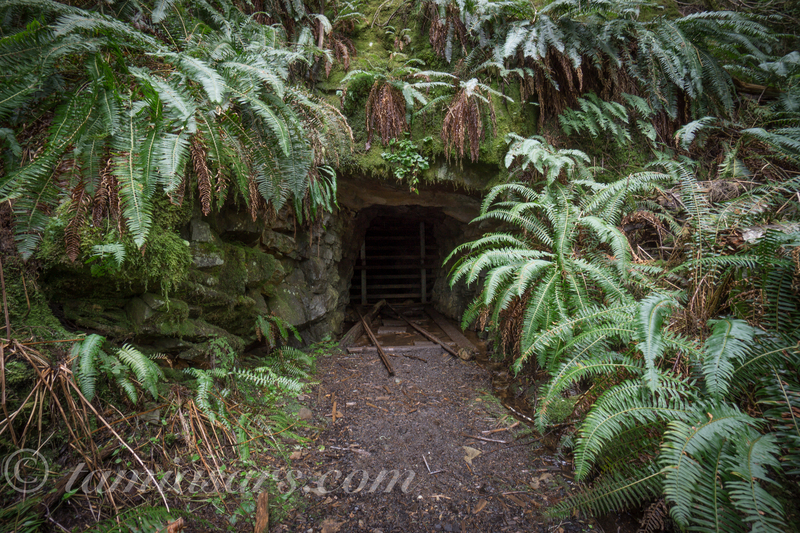 On the way back, I stopped by an old mine, originally part of 30 mining claims established by Washington Mining Company in the area in the early 1900’s. My mind zipped back in time and I tried to envision going to work every day with primitive tools pounding away at stone. How spoiled we are to live in this present generation! Then again, are we? Things have become so much more complicated, yet, the average life span is much longer and life is pretty good overall. Technology is great, but the constant communication without much respite for quiet… bleh. There were many thoughts to chew on as I popped the last of my almonds into my mouth. It was great to be back at Mount Rainier. 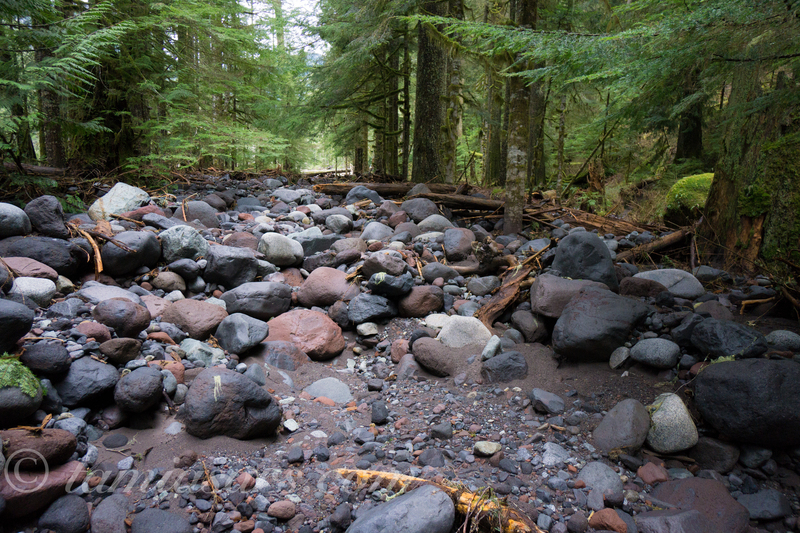 Click here to read about fires affecting the Wonderland Trail. As of yesterday, this bold, red letter print appeared on the Park’s web site. 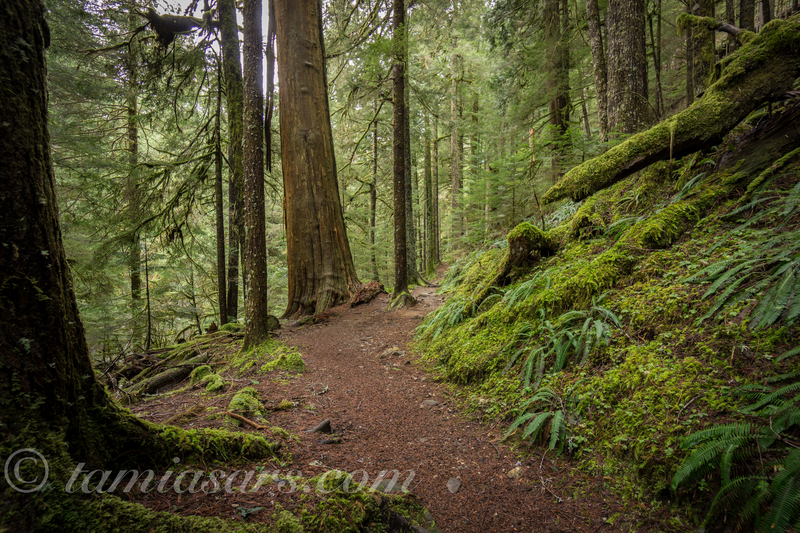 They are completely buried in requests to hike the Wonderland Trail. I wish I lived closer to volunteer a few hours a day helping them process these requests! Wilderness Permits & Reservations – April 21, 2014: SUMMERLAND AND INDIAN BAR ARE FULL FROM MID JULY TO LATE SEPTEMBER. As of today, we are still processing reservation requests. We received 2,000 during the March 15-31 time-frame. 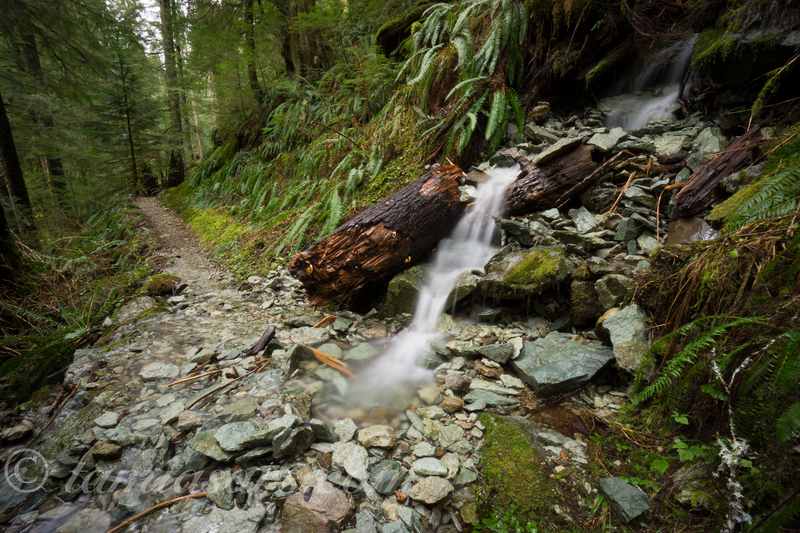 We have now reached the point where we are not able to successfully process the majority of requests for Wonderland Trail permits. Permits received after March 31 have much smaller odds of being fulfilled. If we are not able to book your trip we will send you a letter notifying you of this. Processing began April 1. Many camps are now full, especially between mid-July and late September. 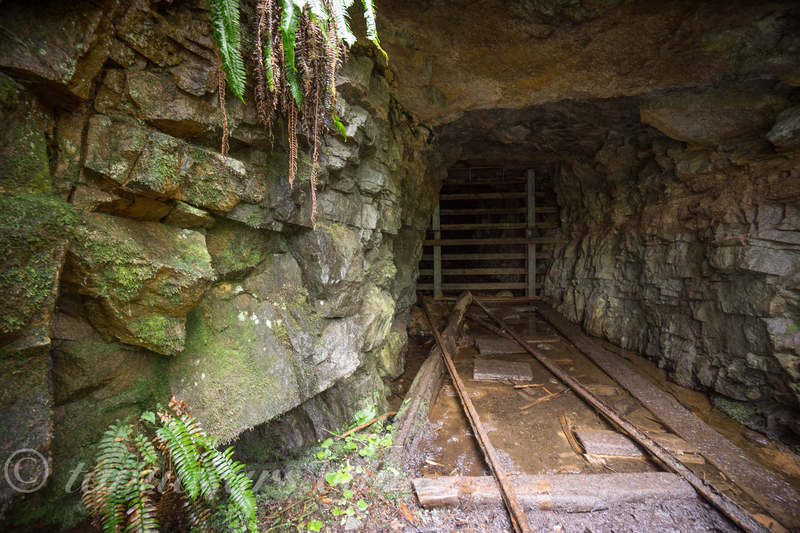 The option to a reservation is a first-come, first served permit. Requests received in March, April and May could take up to eight weeks to process because of the large number of applications. Each one is processed by hand with usually only 1-2 rangers assigned to this duty. It will be well into May/early June before this initial batch of reservation requests are completed. This means you may not get a reply from the park for some weeks, depending on when your request is processed. As the season goes on and the initial pile of requests are whittled down, the park is able to process and reply to reservation requests in 1-2 days.